There are so many reasons why we love our pets. From the way they greet us at the door to the unconditional love they always share, living with pets tend to make us happier human beings. Cleaning after them, however is another story. Our playful Shihpoo, Otis, doesn’t shed much but he along with my three boys love playing outside and track tons of dirt into our home. Life with three kids and a playful pup doesn’t leave much time to spend constantly cleaning up their messes. But whether you’re a parent, pet-parent or both you know these messes tend to be completely unavoidable—especially if you own light colored carpet, furniture and/or rugs like we do! The cost of hiring a professional can add up really quickly. I learned this the hard way our first year with Otis. Between the food stains from his favorite treats he likes to eat on the rug under our dining table to the odor he leaves sleeping on our couch, who knew such a small pup could be the cause of so much work! That’s when I decided to look into DIY carpet cleaning. I tried everything from renting vacuums to purchasing an expensive, heavy-duty steam cleaner. Both required a ton of effort that didn’t always feel worth it since the next mess was usually right around the corner. 1. Easy to use—seriously, my four year old can maneuver it! I love that it allows the kids to be able to help out with cleaning the pet accidents. 2. Exceptional results—so well that I’ve been cleaning our carpets more frequently than before. There was a stain from where Otis spends most of his time laying on our rug and after one run through the rug looks brand new! 3. Great design—not only is it a great size and lightweight, it also comes with some amazing features like: quick clean and deep clean, Heatforce for faster drying and a large capacity tank so you spend less time emptying and refilling. 4. 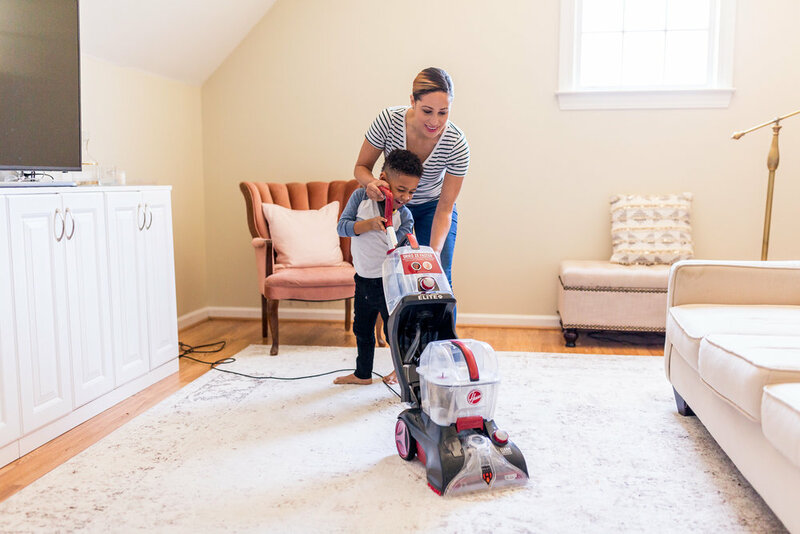 Best value—I’ve purchased steam cleaners that cost much more than the Power Scrub Elite Pet Plus Carpet Cleaner, but none worked as well as this powerful machine. Don’t waste anymore of your money, time or effort trying to remove pet stains. Treat yourself to the Power Scrub Elite Pet Plus Carpet Cleaner, you won’t regret it! This post was written in collaboration with The Home Depot. As always, all thoughts & opinions are my own. Thank you for supporting the brands that make this blog possible!